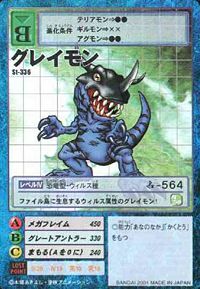 A Virus attribute Greymon with a bluish-black body. 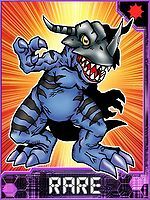 While it has been called a 'feral Greymon', befitting its more violent disposition, it is in no way a lone wolf and possesses enough intelligence to work together with its allies as a team. Its Special Move is a blast of high-temperature flames spewed from its mouth (Mega Flame). 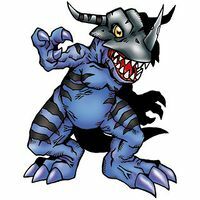 A Greymon that has evolved to become Virus attributed and gained a bluish-black body color. Although its personality is wilder and more brutal than its Vaccine counterpart, it has not lost its intelligence, and will cooperate with its allies to bring down an opponent. 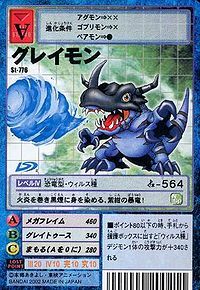 A Virus attribute Greymon with a bluish-black body. 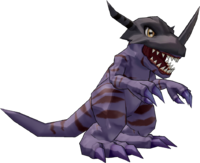 While it has been called a 'feral Greymon', befitting its more violent disposition, it is in no way a lone wolf and possesses enough intelligence to work together with its allies as a team. | Grey is most likely a misspelling of grea, short for great (「グレイト」 Gureito). It also may come from grey (「グレイ」 Gurei), meaning old or ancient. Mega Flame  メガフレイム Mega Fureimu Nova Blast Fires a gigantic ball of flame from its mouth at the opponent. Great Horn  グレートホーン Gurēto Hōn Great Antler Drop Shoots forward horns first. Headbutts the enemy with its powerful horns. 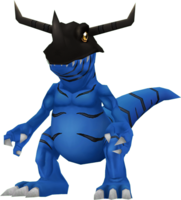 Greymon is an unlockable character. 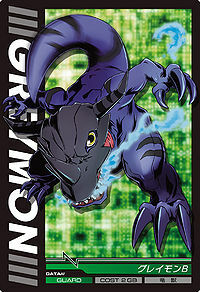 This virus Greymon is overflowing with power! 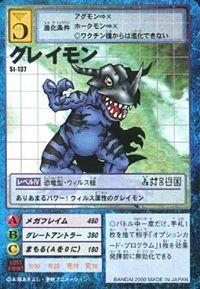 A Virus-attribute Greymon which inhabits File Island! This violent, indigo dragon spits out a spiral of fire and black smoke that dyes its body black! Its body turned blue as a result of taking the Virus evolution path. Although it is feral and more brutal than its Vaccine counterpart, it still retains the intelligence to cooperate with its allies. This page was last modified on 15 April 2019, at 22:54.